The “Chinese Opera TV Quiz” held by CCTV has given rise to short opera performances, prompting a new form of art that might help preserve operas listed as intangible cultural heritage. With the advent of new media and fast-paced lifestyles, people have entered an era of “micro-living,” which is filled with “micro-art.” Along with “micro-drama” and “micro-film,” “micro-opera” is an emerging trend. For example, the “Chinese Opera TV Quiz” held by CCTV has already presented the traditional Chinese opera in the form of a micro-opera. 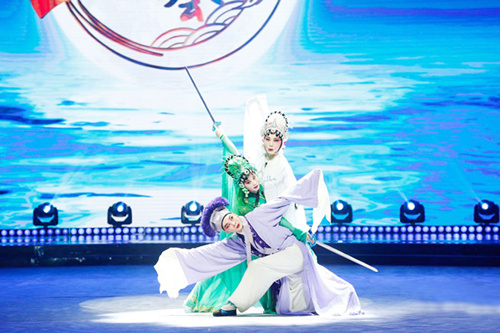 As Chinese opera gains more notoriety among the public, micro-opera is bound to become an important aesthetic form of popular opera and contribute to the revival of traditional culture. Micro-opera is defined mainly by its length and volume. Scholars still haven’t reached a consensus on what falls into the category. Therefore, with reference to the length of micro-dramas and the micro-films as well as the particularity of opera, we tend to define micro-operas as those with a length ranging from 6 to 12 minutes. Such a length not only considers the duration that readers and audiences can generally endure given the fast pace of life but also the time needed to convey a complete story. In addition to being less time-consuming, micro-opera also has the following characteristics. To start with, it is independent in the sense that it could stand alone and be a complete performance, though such independence could be both absolute and relative. The former means that opera itself could be taken out of context and has a standalone storyline and performance, whereas its relativeness means that the reception and appreciation of micro-opera requires certain context and background information. Therefore, micro-opera is by no means a simple act of breaking up the whole into parts, and it is different from animations of Chinese opera that present content in a series. Second, it is a highly condensed art form. Because it is short, it has to be packed. In this sense, it bears similarities to opera highlights but is capable of reaching a wider audience. For example, Kunqu opera highlights usually last 20 to 30 minutes, whereas micro-opera is only half or one-third that length or even shorter, so it has a more condensed storyline and stage performance, putting high bar on art consolidation. Third, it must have a hook. To be specific, micro-opera must be able to catch the audience either by content, story, singing, stunts, dances or makeup. Opera highlights could be seen as the essence of opera performance while micro-opera needs to be the essence of the essence in a way. Next, in terms of channels of transmission, it has an edge over traditional opera in modernity and convenience. In particular, its short length makes it more accessible than traditional opera. Finally, it has diverse forms of presentation. It could be real people playing on the spot, a video performance or animation. Such diversity allows it to better penetrate into modern life. To a great extent, micro-opera has overcome the shortcomings of traditional opera, which is often characterized by slow pace and prolonged performance. With highly condensed content, it offers audiences a glimpse of the essence of traditional opera. Content that is fast but attention-grabbing is indeed a recipe for success in modern life, making it a potentially powerful force for the protection and preservation of operas listed as intangible cultural heritage. The commercial potential of micro-opera as a means to protect operas listed as intangible cultural heritage can be seen in the audience’s acceptance and participation. In other words, we need to find ways to make opera compatible with modern life scenarios to reach a wider audience and engage more fans. First, we need to find various means to cater to the interests and aesthetics of audiences of different backgrounds, regions and ages. Focus Media could be used to attract targeted audiences or perform in theatres one episode a time or in a series. It is also suggested that long and short opera performances be combined into one show or in the form of a stage play plus micro-opera. It could be embedded into TV shows while the internet could also help transmit standalone short opera performances and promote the popularity of the art form. Finally, micro-opera competitions are indeed plausible ways to draw amateur actors to participate in opera performances, thus expanding their social foundation. At the same time, there is commercial interest involved in the industrialization of micro-opera. In the form of micro-opera, the consumption of intangible cultural heritage is commercialized with the aid of production and research. As a result, the “commodity attribute” of micro-opera is better recognized, which could greatly promote the longevity of operas listed as intangible cultural heritage in modern society. However, the development of micro-opera must bear in mind the following two aspects. First, scholarly research is essential, especially the study of opera highlights. Due to its length and volume, micro-opera has stricter requirements than opera highlights, which determines that research must be concrete and detailed before the production and promotion of micro-operas. Storylines, plots, settings, songs, actions and hooks must be carefully designed to make micro-opera short but splendid and even profound. Therefore, though the task may appear to be simple, content selection and climax arrangements of the micro-opera are in fact highly academic. In particular, for the sake of protecting operas listed as intangible cultural heritage, there should be a comprehensive understanding of the characteristics and history of a certain opera in order to identify the most valuable part that can represent and preserve the legacy of the opera, which is why we should pay attention to opera highlights that capture the artistic essence of classical Chinese opera. The highlights of Kunqu, the “king of operas,” have significant reference value and deserve more attention. Second, the relationship between inheritance and industrialization must be properly handled. Due to its potential for industrialization, micro-opera is vulnerable to alienation in the market context, thus it is at risk of gradually losing its role in inheritance. It must be pointed out that the listed operas are most important as a cultural heritage not a cultural industry. Heritage shall always come first, whereas industrialization is merely a commercial possibility. If reversed, the consequences can be catastrophic. With the fragmentation of modern life, micro art products have become a trend. Though it could potentially be destructive to traditions, it also brings some opportunities. A direct result of micro forms of art is that it leads to the diversification of audiences, who are confronted with more choices but harder decisions. Therefore, the competition in contemporary art consumption and aesthetics is fierce and things will probably get worse in the future. In this sense, reducing the length of works is far from enough. They must be splendid to attract more attention and win a place in modern life. It is worth mentioning that micro-opera too has advertisement value, making advertisement placement and sponsorship possible, which equips it with room for future development. To be optimistic, micro-opera could even become the mainstream style of modern opera consumption, which poses new challenges to the wisdom and capacity of practitioners in the industry. Wang Ning is from the School of Humanities at Soochow University.